Location: Meyras, in the Haute-Savoie departement of France (Rhone-Alpes Region). Notes: The castle of Hautsegur is a private castle located in Meyras, France.The castle consists of a massive square body, flanked by a round tower to the west and a turret of staircase that serves the floors. The four corners of the square massif are flanked by a defensive device, four peppers supported by curious crows in vaugnérite. On the ground floor there is a large vaulted room of about 100 m2, which forms the base of the dungeon. His first destination was that of a "men's room" where the defenders of the castle stood. It was later transformed into a kitchen with the addition of a large fireplace that occupies the back wall. From this room one can now access the staircase with screw built around a central pillar that serves the two floors of apartments and gives access to the vast attic and the belvedere. But this door must not have existed at the beginning, any more than those placed on either side of the vast room. Indeed, the communication between the "men's room" and the staircase was pierced in 1597, as indicated by the date engraved on the lintel (13 1597 DE). Another date, above the door on the left giving access to the large room on the 1st floor, indicates: 1598 20 AUGUST (20 August 1598). The access to the floors is therefore made by the spiral staircase which is approached from outside by a decorated portal which is, with the chimneys, the most beautiful sculpted piece of the castle.The building was listed in the Inventory of Historical Monuments in 1937.1 It was inhabited for many years and belonged to various owners until its acquisition in February 2010 by Patricia Demangeon, who has been working since Revive and restore its original appearance. 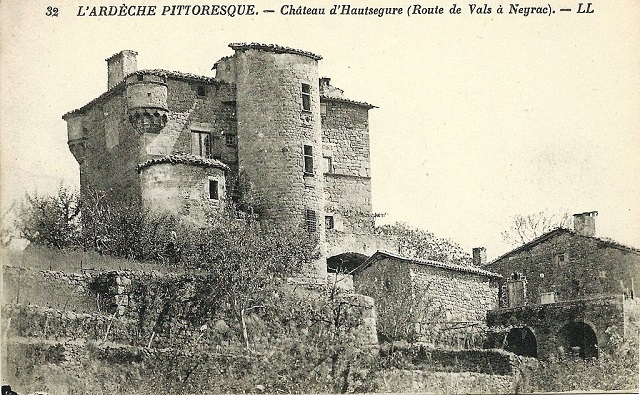 Formerly known as the Ruppesegura (16th century), Altasegura (Mazon), the 17th century, Rochesegure, Rochesure (Parish Registers, 1668), the XVIIIth High Segure (Map of Cassini) 4 its location above the valley Of the Ardèche, made it a position of watch of strategic importance. Hautsegur is located on the route of an ancient Roman road which connected Meyras with the spa of Neyrac, already known and appreciated by the Romans. Indeed, up to the opening of the main road from Alès to Le Puy, via Aubenas (current N102) 5 and that serving Burzet and the Bourges valley (present departmental 536), Meyras was an important communications node , And the only crossing point between the valleys of Bourges, Fontaulière, Lignon and Ardeche, through which all traffic between the Bas-Vivarais and the mountain passed. The Romans even established an advanced camp in Champagne (Campus Montispodis) to monitor access to the mountain passes.